This is what the LORD says: "Cursed is the one who trusts in man, who depends on flesh for his strength and whose heart turns away from the LORD. He will be like a bush in the wastelands; he will not see prosperity when it comes. He will dwell in the parched places of the desert, in a salt land where no one lives." But blessed is the man who trusts in the LORD, whose confidence is in him. He will be like a tree planted by the water that sends out its roots by the stream. It does not fear when heat comes; its leaves are always green. It has no worries in a year of drought and never fails to bear fruit." (Jeremiah 17:5-8, NIV). There are a lot of people in the United States who are extremely nervous right now. The economy is tanking, unemployment figures keep climbing, and a Democrat run Congress as well as President Obama are swinging hard left into a socialistic agenda in order to (supposedly) fix the nation's economy. From my tone you can probably deduce that I'm not in favor of this approach, but that is not the point of this post. 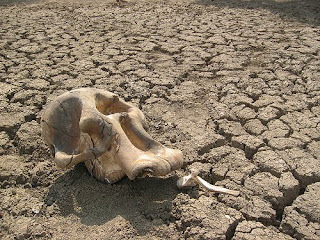 As a nation, we have entered into a time of drought. All of the financial numbers point to the fact that we have entered into a major recession that will take some time from which to recover. Many Christians and non-Christians alike are worked up about the fiscal policies that are coming out of Washington right now, and I don't blame them. I support the right of every US citizen to protest against bad financial policy. As Christians, though, we need to be very cautious of one thing: in times of drought, be sure your trust is in Almighty God and not man. If we are to be blessed as a nation financially, we need to move back to our Judeo-Christian roots not only in terms of money, but also in morals and ethics. Man's way only leads to more drought and lack of prosperity. God's way leads to a confident prosperity. Trust in the Lord and place your confidence in Him.